Beignet (pronounced "ben-yay" in French) literally means "bump". Beignets were brought to Louisiana by the Acadians from Canada who arrived there from France. These were fried fritters, sometimes filled with fruit. Today, they are a pastry made from deep-fried dough like a doughnut only square and sprinkled with confectioner's sugar. Shhhhhh! I'll share a little secret with you. Shhhhhh! You don't need beignet mix or make a dough from scratch to make beignets! All you need is a can of basic biscuits, nothing fancy just plain old generic biscuits. You can leave them round, cut them to form squares or into rectangular "fingers" which are easier to eat. Using the leftover dough, form another square or finger biscuit; then deep fry them in hot oil. Remove from the oil and place on a plate covered with paper towels to absorb the excess oil, then sprinkle confectioner's sugar over them. That's it!!! Now you can have your own Cafe du Monde experience at home! Serve them with ice cold milk or cafe au Lait (which is coffee with lots of milk in it). Community Coffee can be found in most grocery stores around the nation. 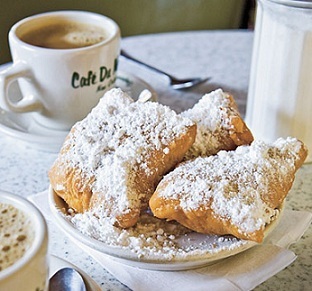 The New Orleans Blend with Chickory is what is served at Cafe du Monde in New Orleans. My favorite is the Cafe Special. Turn on some New Orleans jazz, make some Cafe au Lait and Beignets, transport yourself back to New Orleans and have a nice relaxing breakfast! Enjoy and you're welcome!!! What a great idea! Sure takes the work out of them and I can't wait to try these! Happy Holidays, cher! I made these during the Superbowl..I did a good job I use bread flour..yum.